The 2008 financial crisis dealt a devastating blow to many American families and ignited the Occupy movements on Wall Street and across the United States. To this day, no high-ranking financial industry executives have been prosecuted for actions that precipitated the crisis and the Dodd-Frank Wall Street Reform and Consumer Act, written to forestall another crisis, is woefully behind in execution. This painting embodies the Wall Street culture at that time, born of a lack of accountability and absence of effective government oversight (i.e., the Securities and Exchange Commission), and coalesced around the NYSE pediment sculpture entitled "Integrity Protecting the Works of Man". 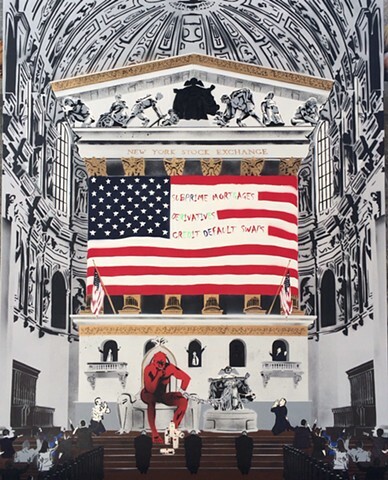 The NYSE is the temple in a gothic church and Integrity (the central figure in the sculpture) is shown as captured by and under the control of Satan, thereby encouraging rampant acts of greed by bankers and financiers who are exalting him from the pews.